Enduring daily challenges like long commutes, marathon conference calls, last-minute deadlines, workouts and other stuff can often feel like an expedition to hell. But, if you’ve got to brave the wild, at least go prepared. That’s what Bear Grylls, host of Discovery Channel’s “Man vs. Wild” does. Of course, he’s British and has only now discovered what many of us in California have always known. When the going gets tough, the tough eat almonds. Lots of us grew up with almond trees in our own backyards, beautiful blooms in spring, tasty meats in late summer. But, according to the Almond Board of California’s North America Snacking independent survey, the word on almonds hasn’t reached the far corners of the globe yet. A new report says consumers snack about twice a day, and men in particular are looking for filling and satisfying snacks with protein. So, if like Bear Grylls, you’re planning to climb Mt. Everest, be sure to bring along some power snacks for survival. The almond board offers man-friendly recipes to make the hardships bearable (no pun intended). When Grylls is on a mission in the extreme wild, he overcomes hunger with whole, unprocessed foods like almonds, fruits, vegetables, whole grains, soy, avocados, beans and oats—all survival foods that come from our own California gardens and farms. 1. Don’t leave home without survival food. Almonds are the ultimate survival food in extreme conditions and everyday life. They are lightweight and don’t perish in cold, wet, or heat. Tuck them away in a waterproof pocket or resealable bag. 2. Be heart-smart. 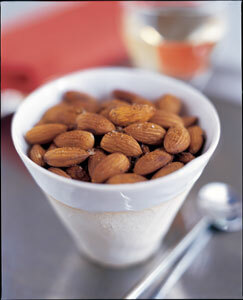 Get the heart muscle pumping every day and choose heart-smart foods like almonds. 3. Fill up on satisfying snacks. (almond again). 4. Eat almonds. They have protein. 5. Snack on wholesome foods. Try almond butter with a smashed banana on whole-grain bread. preparation Stir together chipotle, sugar and salt in a small bowl, and set aside. Heat almonds and almond oil in a large skillet on medium-high heat, stirring and shaking pan occasionally, until almonds’ skins are “popping” and almonds are fragrant. Turn heat to medium-low and stir in chipotle mixture; heat and shake skillet for about 30 seconds, to release chipotles’ oils. Transfer to a bowl and let cool just slightly before serving warm.